This water crisis is hitting half the capital's population like an arrow to the leg -- not enough to kill (as far as I know) yet painful enough to temporarily paralyze. I can't help but laugh at the timing of the drought and when I picked up one of my more recent reads. 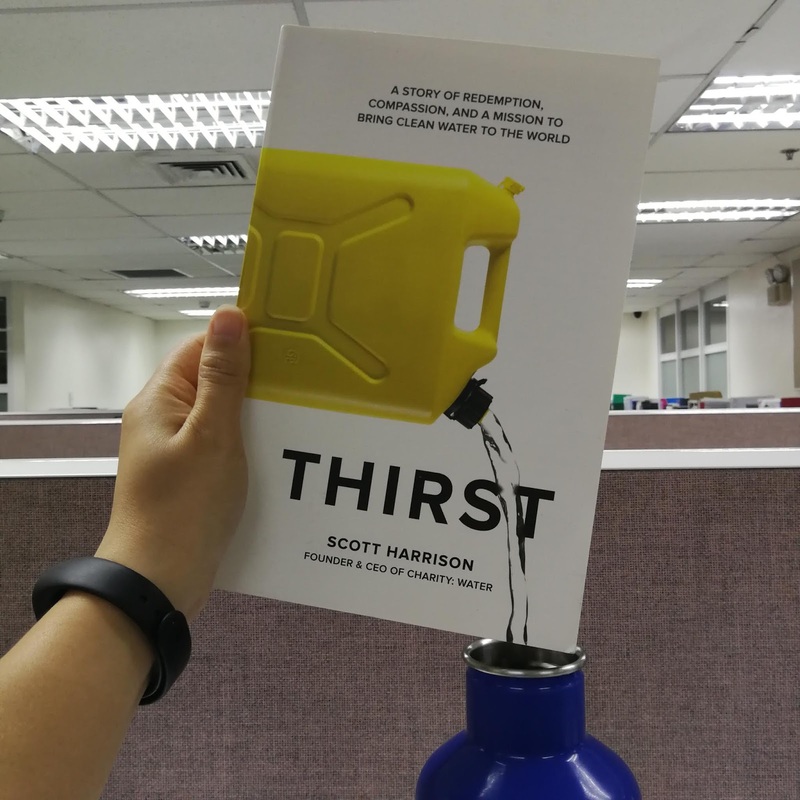 At the brink of the water crisis, I finished reading Thirst, a book about an ex-club promoter who put up a non-profit that brings clean water to remote communities around the world. To call the book inspiring is an understatement. I couldn't help but devour it in three days, drinking it all up. The book gives a soul to the global water crisis. Everyone knows about the crisis, how our limited freshwater supply is dwindling, and how there are people who don't live with the same conveniences of clean water like we do. We know this is happening in some unknown places in the world, and this book helps internalize what they go though. Thirst humanizes the situation and introduces you to real mothers, children, families, elders who struggle from not having the liquid gold we sometimes take for granted. I’ve never lived in a world where water didn’t come out of taps. Observing the way we use water, we act like it is lightyears away from depletion. The current crisis in Manila is slowly concretizing what is happening on a global scale. My "worst" experience of drought was one summer in grade school. El niño was to blame for the low water pressure in our apartment on the third floor. Water would trickle out of the faucets, dripping a bit faster than a leaky tap. We had to line up downstairs at one of the building's several communal faucets, fill our buckets, and carry them up the stairs. We'd pour them into a big drum, run downstairs, and do it all again. I remember hating that chore because it took away precious play time. It was summer after all. I was too young to see the deeper implication of why we had to spend our days fetching water. I was reminded of that summer when reading Thirst. Women and children would walk for hours to get a few gallons of water to last a few days until charity: water found clean water for the community. Though leagues away, I was experiencing shallow inconveniences for having no water. It meant I couldn't play, flush the toilet, or even wash my hands whenever I wanted. Our drought lasted a summer. Some of the communities featured in Thirst had never experienced clean, running water. We walked down a few flights of stairs indoors, while they had to trek for hours under the sun. Worlds away. Imagining yourself in their shoes can be stressful, and I would never wish that upon anyone. The good news is, several of the communities have been helped by charity: water, and other similar organizations. The bad news is despite our depleting global freshwater supply and wasteful water practices, there are still 663 million who don't get to tap that resource. More good news though -- we can do something about it! The less we consume -- food, clothing, transport, anything -- the less water we use, since most if not everything needs water to be made, processed, and/or run. This may seem far-fetched, but we need to do what we can to use our limited resources wisely. Since we've been having water disruptions, I find myself bathing and washing dishes with so much precision as if we'll run out of water tomorrow, as if every drop of water is like money in my wallet. I even cut my hair because washing long hair got inconvenient. When water is like gold, you tend to maximize its use in the best way possible. If only we could uphold similar principles for other things, whether or not we are in a crisis. I've started using balde and tabo to take a bath/brush my teeth/wash my face, and we collect bath water and dish water for the garden. We've also stopped watering our grass because it's summer anyway and keeping it alive and green would have meant a lot of water consumption.